Emmanuel and Esther Durand are a Franco-Welsh couple with four children: Jean-Baptiste (9), Maxime (6), Benjamin (3) and Clémence (5 months). They work in France with UFM Worldwide. After several years in Cardiff, they moved to Guingamp, Brittany in August 2010 to work in the context of a local church. 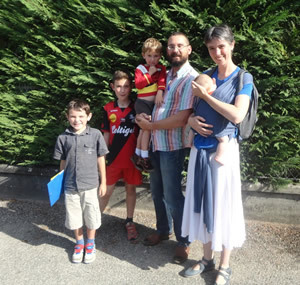 In August 2014, they moved to Cognin, on the outskirts of Chambéry, in the French Alps.Their main burden is to make Christ known in France, but also to help French Christians to grow in grace and in the knowledge of The Lord. Cognin is a small town of about 6000. There has been an evangelical witness in Cognin for the last 25 years. The church they attend is the church where Emmanuel grew up, but it is also where Emmanuel and Esther met. Over the last few years, no church member has lived in the centre of the town. Emmanuel, Esther and their children now live at the heart of the community and so have a unique opportunity to witness locally. Emmanuel is also following a Masters course in theology in the Faculté Jean Calvin, in Aix en Provence.